An excellent foundation for future success. We develop the God-given talents of your child(ren). Holy Rosary Academy is the second largest elementary school in the diocese of Nashville, Tennessee and has the approval of the Department of Education of the State of Tennessee, the SAIS, and the Southern Association of Colleges and Schools (SACS). Holy Rosary Academy is fully accredited by the State of Tennessee, the Diocese of Nashville, and AdvancED and follows the curriculum of the Diocese of Nashville. 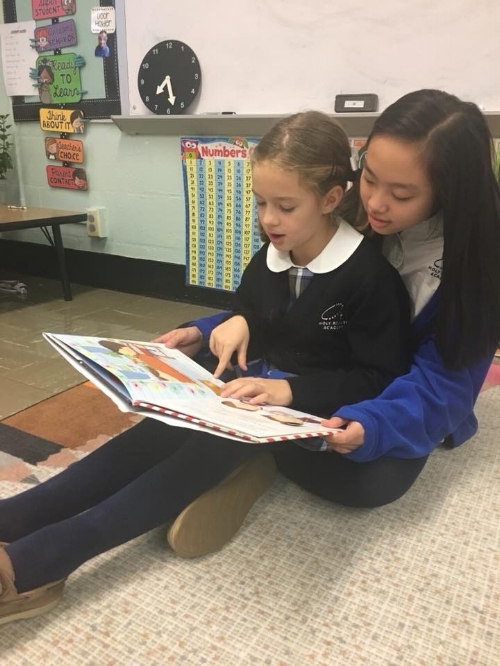 At Holy Rosary, we attract faculty and staff whose academic achievement and personal promise make them positive members of our school community. We are a member of the Parochial League of the Diocese of Nashville. Students may participate in basketball, cheerleading, cross-country, football, golf, soccer, tennis, volleyball, wrestling, golf, and many more. Eligibility for these sports varies according to grade level. Holy Rosary Academy offers its students the opportunity to participate in a wide array of activities. Take a look at what your child's day look like. Holy Rosary Academy offers Pre-Kindergarten through 8th grade and applications for admission are now being accepted for the 2018-2019 school year. For more information concerning our school or to request that an admissions packet be sent to you, please contact Alaina Dougharty, Director of Admissions.